William Frank Szymczyk (/ˈsɪmzɪk/; born February 13, 1943) is an American music producer and technical engineer best known for working with rock and blues musicians, most notably the Eagles in the 1970s. He produced many top albums and singles of the 1970s, though he retired from the music business by 1990. He re-emerged in the late 2000s, taking on select projects including the 2007 Eagles album Long Road Out of Eden and the 2008 eponymous debut of Brian Vander Ark. Unlike many music producers, Szymczyk has no background as a musician. He was originally a sonar operator for the U.S. Navy and took some audio production classes as part of his Navy training. Besides his work with the Eagles, he has produced hit songs and albums for such diverse artists as B.B. King, Joe Walsh, The James Gang, and Elvin Bishop. 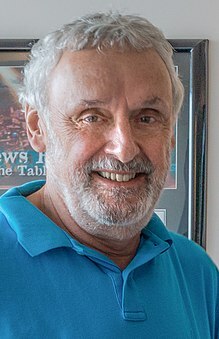 Bill Szymczyk was born in Muskegon, Michigan on February 13, 1943. His mother worked as a nurse, and his father held several jobs, including factory worker and maintenance at a school. Growing up, his first introduction to music and electronics was when he built his own crystal radio from a kit. Using his radio, he became a fan of blues and R&B while listening to a station out of Nashville, Tennessee. He joined the United States Navy in 1960, where he worked as a sonar technician. It was in the Navy that he took his first course in radio and television production. Upon leaving the service in 1964, and without much of an idea of what to do for a post-military career, he enrolled at New York University's Media Arts School. Szymczyk began working at a firm which produced demo recordings for Screen Gems Records and worked extensively with Brill Building songwriters such as Carole King and Gerry Goffin. He also worked as an assistant to music producers and songwriters Quincy Jones and Jerry Ragovoy, eventually working his way up to chief engineer at Ragavoy's Hit Factory recording studio in New York City. His first work as the primary producer on an album came for a Harvey Brooks solo record. He dropped out of NYU to work full-time in the music industry. He left the Hit Factory and took a job at ABC Records, taking a large pay cut in exchange for the opportunity to move from engineer to producer. He successfully lobbied ABC to let him work with B. B. King, whose own record label was a subsidiary of ABC and who was a long time idol of Szymczyk's. After Szymczyk convinced King that he could improve his sound to make him more appealing to a wider audience, King himself agreed to let Szymczyk produce for him. Among the albums he produced for King are the 1969 live album Live & Well, King's first ever top-100 album. He produced his follow-up studio album Completely Well, which featured "The Thrill Is Gone", the biggest hit of King's career and his signature song. He would continue to produce blues albums throughout the early 1970s for the likes of King and Albert Collins. Szymczyk was moved several times while working for ABC Records; first to Los Angeles when ABC acquired Dunhill Records and Szymczyk took over production for the West Coast operations, and later to Denver when he decided to form his own label, Tumbleweed Records. He worked for a while as a disc jockey at radio station KFML, and continued to produce albums in New York and Los Angeles, such as the J. Geils Band's 1971 album The Morning After, recorded at the Los Angeles Record Plant. He did extensive work at the Colorado studio Caribou Ranch, which would be the center of his operations for the rest of the 1970s. His long relationship with the Eagles began with their 1974 album On the Border, an album he took over from London-based producer Glyn Johns. He would be the sole producer for the next three Eagles studio albums, including 1976's Hotel California, the first to feature Joe Walsh. Szymczyk was instrumental in giving the Eagles a more "rock sound" and helping them to move away from their country rock roots. Among the other acts he worked with extensively through the 1970s include Michael Stanley and the J. Geils Band. While working with The Outlaws, he coined the term "Guitar Army" to describe the band's sound; the name continues as a nickname for the band. He worked in the studio for the Edgar Winter Group's biggest hit, the Rick Derringer-produced "Frankenstein", and later produced Derringer's best known solo album All American Boy and its hit single, "Rock and Roll, Hoochie Koo". At the start of the 1980s he was a highly sought-after producer, and worked on such albums as Bob Seger's 1980 album Against the Wind and The Who's 1981 release Face Dances. During this time period, Szymczyk produced such hit singles as Elvin Bishop's "Fooled Around and Fell in Love", The Who's "You Better You Bet", The Eagles' "Hotel California", and Bob Seger's "Against the Wind". His workload tailed off in the mid-1980s, due mostly to his own financial success. He officially retired from the music industry in 1990, but re-emerged in 2005, producing Dishwalla's self-titled fourth album. He returned to work with the Eagles on the 2007 album Long Road Out of Eden, and followed that with the 2008 solo debut of ex-Verve Pipe singer Brian Vander Ark. He now lives in Little Switzerland, North Carolina with his wife Lisi. The couple have two sons, Michael and Daniel, and have become involved in their local community, having raised money for a local shelter for victims of domestic violence, among other charity work. He still works as a producer, but is more selective about projects he works on. Szymczyk's has frequently been noted as the sort of producer who pushes bands to expand their musical horizons; he has been brought in with the specific intent of changing a band's sound. He himself has credited this tendency to his lack of musical knowledge, stating: "I'm a professional listener. I listen and I react. I never was a musician, so I don't bring any preconceived prejudices to the table; I don't favour the guitar over the keyboard, and so forth. I just listen and try to figure out if I have anything I can bring to a song." For his work with the Eagles, he has been cited for his innovative mixing of drums, laboriously working to get the right microphones and placements for just the right sound. Rather than recording harmony vocals individually, and mixing them together later, as was common, Szymczyk preferred to capture the Eagles singing in ensemble, often spending many hours to record each phrase "just right". For the Elvin Bishop hit, "Fooled Around and Fell in Love," it was Szymczyk who suggested the inclusion of the song on Bishop's Struttin' My Stuff album, feeling the blues-oriented album lacked a pop single. The song would go on to become Bishop's biggest hit. Such a pattern was repeated throughout his career. The Eagles brought him in to refine and improve their "rock" sound, and all of their biggest selling albums and songs were Szymcyzk-produced. Martin Turner of Wishbone Ash has called him "my all time favourite producer". While the two did not always get along during recording, usually over Turner's bass-playing style, Turner does credit Szymczyk with giving the band a more commercial sound on one of their most successful albums, 1974's There's the Rub. All credits as producer unless otherwise noted. ^ Benson, Carl (2005). Encyclopedia of Recorded Sound (2nd ed.). CRC Press. p. 1085. ISBN 0-415-93835-X. Retrieved August 3, 2009. ^ a b Keel, Beverly (2005-12-08). "Life in the Slow Lane". American Profile Magazine. Archived from the original on 2008-10-15. Retrieved 2008-05-29. ^ a b c d e f g h i Daley, Dan (November 2004). "Bill Szymczyk". Sound on Sound. Retrieved 2009-05-29. ^ a b Daley, Dan (2005-02-01). "Classic Tracks: B.B. King's "The Thrill Is Gone"". Mix Magazine. Archived from the original on 2009-06-27. Retrieved 2009-05-29. ^ a b c d e f g Kurutz, Steve. "Bill Szymczyk". Allmusic. Retrieved 2009-05-29. ^ Brown, G. (2003-06-22). "Eagles' Walsh Found His Rocky Mountain Way But Tragedy in Family Led to Rocker's Departure". Denver Post (reprinted at Joe Walsh Online). Archived from the original on July 4, 2008. Retrieved 2009-05-29. ^ Grundy, Stuart and John Tobler (1983). "Joe Walsh Interview". BBC Publications (reprinted at Joe Walsh Online). Archived from the original on June 28, 2008. Retrieved 2009-05-29. ^ "Eagles' Complete Discography: Don Henley Looks Back". Rolling Stone. Retrieved 30 October 2017. ^ Merchant, Teri (2008-05-08). "Sign The Petition -- Vote For The Outlaws To Be Inducted Into The Rock & Roll Hall Of Fame". Southern Fried Magazine. Retrieved 2009-05-29. ^ "Elvin Bishop interview". Songfacts. Retrieved 2009-05-29. ^ "Questions and Answers with Martin Turner". Martin Turner's Wishbone Ash official website. Archived from the original on August 27, 2014. Retrieved 2009-05-29.